The nature of science and membrane structure. The accepted model of membrane structure today is the fluid-mosaic model but this has not always been so. Since 1900 there have been a series of hypothetical structures proposed and tested. The evidence has supported, step by step, a succession of new models each a little closer to the real structure of membranes in nature. The story of this progress illustrates many ideas about the nature of science, especially those connected with exploration and discovery. The 2017 Nobel prize for cryo-electron microscopy is included to illustrate how biological ideas are still changing as new technology helps research. Students cut out the hexagons on the student hexagons worksheet and arrange them on their bench to explain just one of the key points in the blue box below. For example: 5. The hypothesis gets closer and closer to the actual structure found in nature. Students arrange the cards to show the increasing accuracy of the model and work out what you need to say to explain this. Notes could be made next to each card to explain the details of the explanation. There are a wide range of methodologies used by biologists. Imagination and creativity are used to work out the models. There are some flashes of intuition unsupported by the evidence at the time. Evidence from experiments supports or falsifies hypotheses. The hypothesis gets closer and closer to the actual structure found in nature. There is collaborative endeavor between biologists. New technology promotes new discoveries. The table below summarizes a few of the discoveries and the evidence which supports or falsifies the theories. Much important work has not been included for the sake of simplicity, but there is an excellent detailed review of the biology in the Journal of Cell Biology for anyone who wishes to read more. 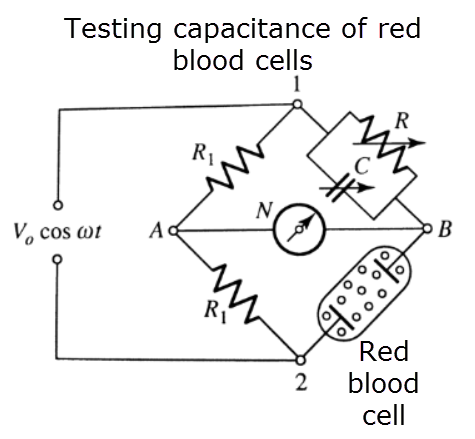 1925 H. Fricke proposed that an interesting application of measuring the capacity of blood is for calculating the thickness of the membrane"
1925 Gorter & Grendel predicted that [red blood cells] are covered by a layer of fatty substances that is two molecules thick. Their theory was supported by measurements of membrane capacitance, estimates of membrane thickness and also by measurements of the strength of surface tension They concluded that the membrane is a lipid bilayer coated on each side with a layer of proteins. 1943 F S Sjöstrand pioneered technological advances using electron microscopes to cut and stain thin slices of tissue. He developed a way to cut and stain membranes with heavy metals. He observed membranes in mitochondria, chloroplasts and myelin sheath cells composed of two thin dark bands separated by a light region. He established a journal of electron microscopy and helped many research students make observations of cell ultra-structure using his electron microscope. Cell membranes have a very similar structure in a wide variety of cells and cell organelles. He observed electron microscope images of a range of cells, including nerve cells. All the images showed the same 'pair of dense lines and a thick light core'. 1961 Danielle, Davson & Robertson revised the earlier membrane model to include the presence of hydrophilic protein pores. This was nothing more than a flash of inspiration, there was no real evidence to support this idea at the time. The partial permeability of nerve cell axons was not explained by the unit membrane model. Further investigation of the structure of membranes is needed. Frye and Edidin in 1970 suggested the cell surface membrane is "not a rigid structure, but is fluid." They fused two cells each with different membrane-bound antigens coloured by fluorescent tags. 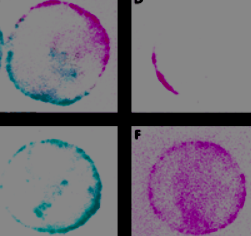 The two dye populations mixed across the new membrane within minutes after the initiation of fusion. They concluded that cell surface membrane or fused cells (called heterokaryons) is not a rigid structure, but allows free ‘diffusion’ of surface antigens resulting in their intermingling. In the unit membrane model the polar parts of phospholipids are unlikely to be covered by protein and thus not in contact with water. The hydrophobic parts of protein are also unlikely to be exposed to water. A mosaic structure of alternating globular proteins and phospholipid bilayer is the only membrane model consistent with experimental data available. Hubbell and McConnell 1968 refined methods of freeze-etching to reveal the topography of membranes. There are large particles within the lipid layer of the membrane. Since 1974 there have been many studies on the functions of membrane proteins and further studies of membrane structure. Functions such as protein pumps, protein channels, hormone receptor sites, or for communication across the membrane have since been discovered. Further information from Jonathan Singer himself. Students explain their diagrams to a partner by telling the key point they chose about the nature of science. This explanation is recorded in some way by the students as a record of their research. Stick the hexagons on paper and write notes around them. Video each other as they give the explanation. Take photographs and build a PowerPoint presentation / or worksheet. Here are some examples kindly shared by students in 2014. Read about the later work on proteins in the membrane in the Further information from Jonathan Singer himself. Activity 3 (Alternative) - How do we know the structure of a membrane? "How do biologists know about things which we can't see?" Arrange the hexagons on the page and write statements outlining how each experiment has contributed to out understanding of membrane structure. These suggestions will help the explanation. Technology which helps extend the senses. Creativity used to imagine a structure which fits the observed data. Ingenious method to make the invisible visible, e.g. using fluorescent dyes. Each experiment described uses a different method for data collection and analysis. Some of the evidence from electron microscopy led to the proposal of the Davson-Danielli model. Fluid mozaic evidence SOLO: Hexagons arranged in a timeline. Fluid mozaic evidence SOLO: Scissors and glue ! Read the details on the worksheet How do we know about membrane structure? about the Daveson-Danielli and Singer-Nicholson models and answer the questions about the role of evidence to falsify or support theoretical ideas. By reading each of the hexagons and rearranging them to explain the 'story' of the discovery of the structure of membranes students will see something of the creativity required in research. Key points of the Nature Of Science will become apparent and students should find the activity engaging. Talking about the information and making presentations will challenge some students. Giving the students a choice will motivate the students, but may involve a bit of classroom management, so they don't all choose the same NOS poinr if one aim is to try to explain all the NOS ideas in a future lesson. Some students will probably need help during this activity if they have not fully grasped the structure of membranes and the components of the membranes. For this activity no real knowledge of biochemistry is needed. Weaker students could be asked to talk about each of the hexagons they have chosen, or to order the hexagons chronologically and identify some of the key points. The timing is aimed to be about 1 hour. However if students present their ideas in larger groups or make more detailed notes this may require extra time. The information is presented in a simplified way and students who choose to read the original papers will see that some of the techniques used are really quite complex. Students may easily find other examples of research as there are many of these which haven't been included for the simple reason of saving time. An alternative sheet, which has the diagram of membrane structure has been added for teachers who wish to have more structure in the work.